It was a great episode when Dr. Lalmani Misra, the great maestro, was born in month of August 1924 in Kanpur on 11th. Dr. Lalmani Misra had all those qualities that made him a great musician of India which normally could not be traced in ordinary human beings. He was from middle class family of Kanyakubj Brahmins; and he had hardworking habit, talented and was always very alert of his duties to serve the country from his boyhood. I personally witnessed his performances in the art form of vocal music in Dhrupad, Dhamar which I can never forget even though he was specially a very famous Batta-been player. He was a top-rank organizer in the field of Indian Music and his project-works undertaken at Banaras Hindu University in collaboration with Sangeet Natak Akademi, New Delhi were superb. Alap Dhrupad, which is the top-most form of Indian musical tradition, was in particular revived by his project, Dhrupad Mela programmes. Dr. Misra was the first man who introduced this programme in India in 1975 and was later continued by a trust created for this purpose, and his followers. I had the golden opportunity to work with him and seen his particular interest in this art-form, which has been successfully revitalized through his attempt, otherwise a dying element in Cultural field of India. Within a month of Alap Dhrupad, similar national gatherings were organized by Dr. Misra for revival of Tappa as well as Thumri. These lighter forms of singing too gained impetus through these conferences. Young generations have been very much encouraged with this plan projected by Dr. Misra. Before his project, there were only few accomplished artistes in this stream of music. After the Dhrupad Mela-s held in Tulsi Ghat and followed in other parts of India we find that a good number of accomplished Alap Dhrupad Singers have been produced. Dr. Misra took to educating the listeners from the stage itself about this art-form. Jointly with concerts in Dhrupad Mela-s the straight-from-dais teaching made Dhrupad very popular amongst the listeners who were used to attending normal concerts (where performances went unexplained and hence partially appreciated). Dr. Lalmani Misra due his exceptional abilities, was well suited to organize seminars on Indian music. These seminars recognized complex areas in theory and practice of classical music and solved several problems for the first time in assemblies of distinguished personalities of music in India and abroad. I had good fortune to be present in one such Seminar directed by Dr. Misra. A special seminar of U.G.C. was organized at Banaras Hindu University in 1972 on the topic, “Music Education in India at University level”. Many experts from all over India had come to discuss possibilities and resolved that music education should be collaborated in all universities of India, at par with other subjects taught in universities. This necessitated formation of an Equivalence Committee to examine and constitute the Syllabi of Music in various universities. Under directorship of Dr. Lalmani Misra the Equivalence Committee examined and based on the suggestions received, forwarded its proposal for equivalence of music education to University Grants Commission, New Delhi. The Commission accepted the proposal and agreed with the scheme. Consequently, all Indian universities have been awarded grants to open Music faculty. It was solely the initiative of Dr. Misra, that made it possible for music to gain support to develop at universities, after the patronage of Raja – Maharajas had stopped. Had it not been for him, sustenance of Indian music might have been jeopardized. Such was the extent and fulfillment of problems solved in this seminar. Dr. Misra previously had founded and nurtured Gandhi Sangeet Mahavidyalaya at Kanpur. In 1958, during the reign of Pt. Omkarnath Thakur, he joined B.H.U. as Reader and Head of Instrumental Music. At that time the highest course offered in university was ‘Senior Diploma Course’. After Misra ji’s joining the department higher degree courses were introduced in the Instrumental department at B.H.U. and gradually much development came to be visible through his sincere efforts. He was a versatile genius. His creative works were in several directions. One can only marvel at his orchestral compositions. One such with wonderful psychological treatment of human beings was presented during Tenth anniversary celebration of Gandhi Sangeet Mahavidyalaya in 1960. During the birth centenary celebration of Pt. Madan Mohan Malviya in 1961, he composed and presented an opera, Meera Bai. Amateur students of the university participated in this version; still, it was superb and highly appreciated. Elevated to post of Professor in August 1967, he also took charge as Dean, Faculty of Music, B.H.U. Dedicated to nurture and growth of Indian music and culture, he introduced courses in Karnataka music, bringing it to academics in North for the first time. Since then, Karnatak music has occupied a prestigious place in the Music faculty of the university. A practitioner himself, he invited top-notch artistes and acclaimed experts to educate students in finer aspects of art. 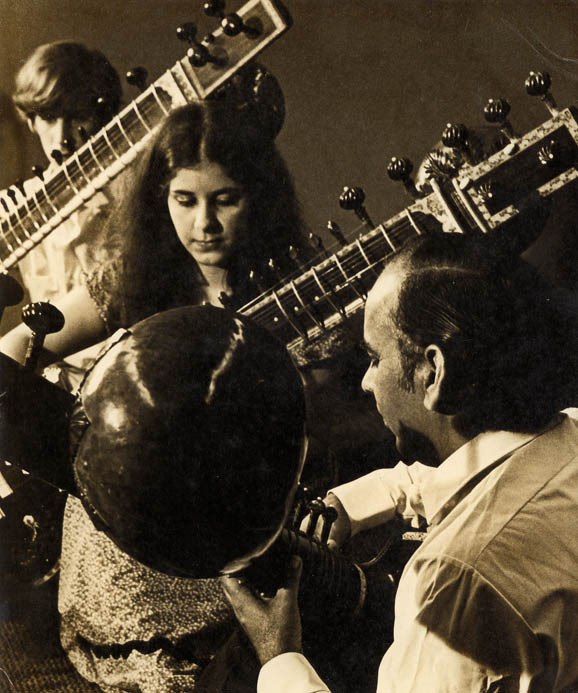 Students could appreciate such experts as Vidushi Amala Shankar, Pandit Ravi Shankar first-hand. The recordings of such greats in Indian music as Ustad Allauddin Khan, Thakur Jaidev Singh etc. addressing the students may still be in archives of the Faculty at B.H.U. He was invited to University of Pennsylvania in 1969 and he visited Philadelphia for two years to nourish Indian music in world academics. He helped start a department of Indian Music studies and would visit there for a semester every year or two for next several years. His teaching methodology was much appreciated by students in U.S. Unlike most musicians who learn by rote and teach the same way, he could offer rational definitions and provide connective links. This made the complex Indian compositions accessible. Even when he returned to B.H.U. in 1971, his American students yearned to learn with him. He started several new courses on his return. The U.G.C. sanctioned it and a doctoral programme in Performance and Composition was started at B.H.U. There already were short termed programmes to bridge the gap between theoretical learning and performance courses. Students from abroad joined these courses in Indian Music and some even completed doctoral award. It was his keen interest and visionary attitude that made him document the successive development of Indian musical instruments and establish an archive for recording of ancient traditional Samic singing. This alone has made the B.H.U. archive a center for study of ancient Samic studies. He directed his students in collection of various traditional chanting schools. One of these students, Pt. Omprakash Chourasiya played significant role in this. He was so inspired by this that he established a choir to present national poetry in strict classical compositions. In fact, Lalmani Misraji was a versatile genius in the field of musical culture in India, who stands beyond comparison to any other musician.